Language is fascinating and as kids grow it is so fun to see how their understanding of language increases. Similes were one of my favorite things to teach when I had my own classroom filled with students a few years ago. Now I love teaching them to my kids at home too! Kids think these expressions are hysterical! As a teacher, I think it is important to teach figurative language to kids. By learning about figurative language, kids are given new tools for describing situations and sharing what they want to say. Idioms, similes, and metaphors are also just fun ways to learn and experiment with language! 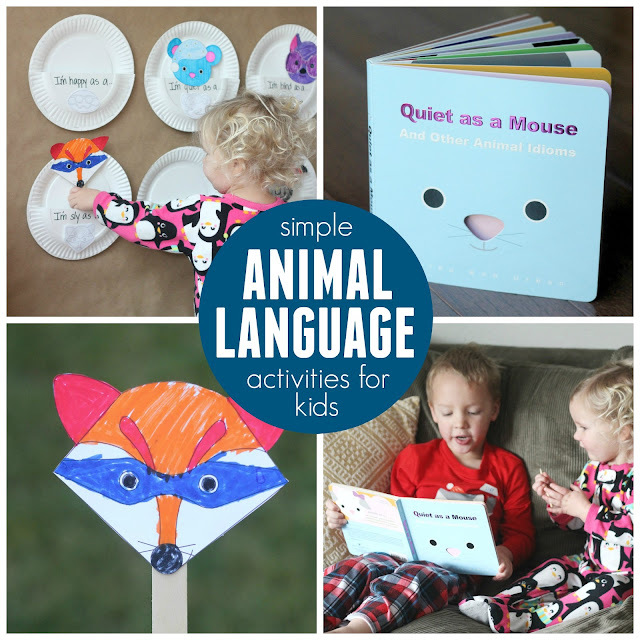 We love animal themed activities and today I am excited to share simple activities you can use to teach these animal similes to kids! This post is sponsored by Chiêu Anh Urban. All opinions are my own. Recently, children's book author/illustrator, Chiêu Anh Urban, sent me her new book to review! Her board book for young children called Quiet as a Mouse And Other Animal Idioms teaches abouts 5 similes in a simple way using an animal theme. The illustrations are beautiful! The rhyming text adds to the charm of the book too and the rhyme, followed by encouragement to guess the animal, adds to the suspense while reading. My kids couldn't wait to turn each page! All of my kids (ages 10 to 2), loved it! Although it is a board book that you would typically use for toddlers, the concepts can be fun for elementary aged kids too. 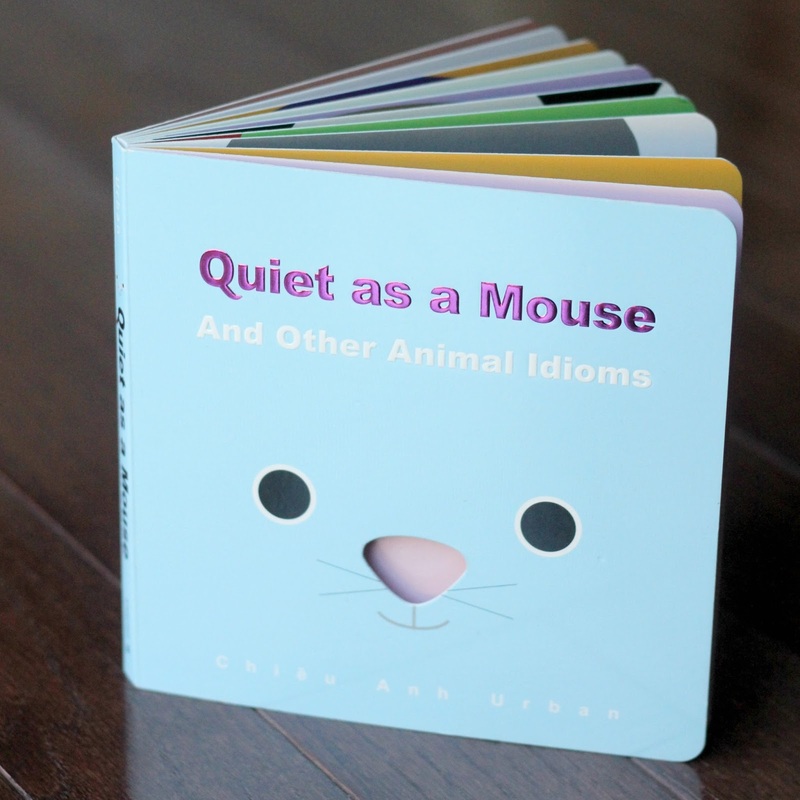 The book shares several common animal similes in a straight forward and simple way. One page tells a brief description of the animal with a black and white partial zoomed in photo of the animal. The next page names the animal that was being described and includes a zoomed out picture of that animal. Kids love to read this book again and again hoping to fill in the right simile by guessing the correct animal when they turn each page! In addition to providing her wonderful book, Chiêu also shared some of the printables that she created to go along with the book. My oldest daughter loved coloring the animal printables so that we could make animal stick puppets for my toddler and preschooler to use. 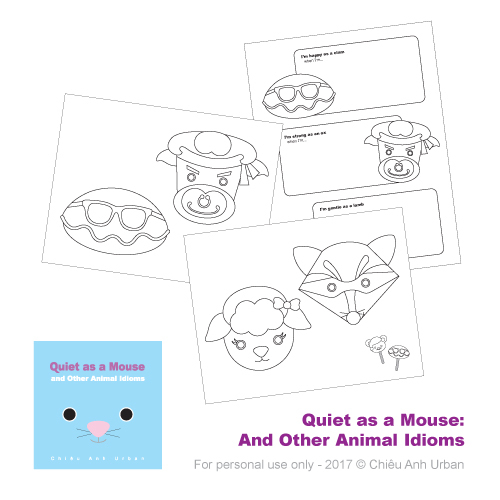 You can download the Quiet as a Mouse printables HERE. Here are a few of the animal stick puppets my daughter made. While we read Quiet as a Mouse and Other Animal Idioms, we had fun holding the puppets and pulling them out when we would get to their page! In addition to playing with the stick puppets, we created a simple activity to help kids learn animal similes! This simple matching activity is very easy to set up and can be adapted for older and younger kids! First, you'll need to print out and assemble your animal stick puppets. Next you'll want to print an additional set of animals in a smaller size on white paper (I reduced the size by 50%). Then, assemble paper plate pockets using two paper plates per pocket, scissors, and a stapler. Cut one paper plate in half and then attach it to a second paper plate by stapling around the edge. Make sure the faces of both plates are facing each other. 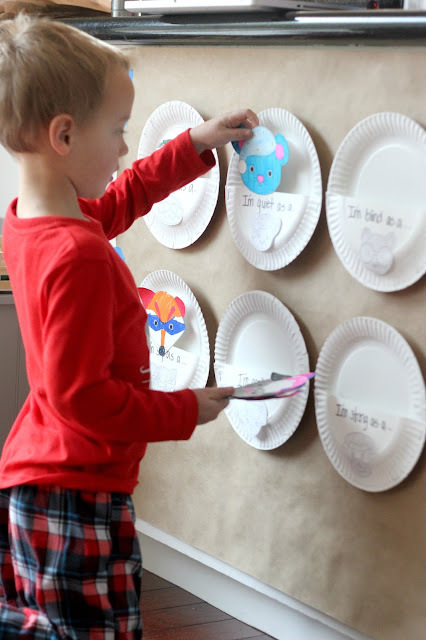 Take the smaller animals and glue one onto the front of each paper plate pocket. On each pocket, write the beginning phrase of each simile. For example, write, "I'm as a gentle as a ____" or "I'm as sly as a _____." Next, attach your paper plate pockets to the wall or a table using painters tape. Finally, give your kids the animal stick puppets and encourage them to match the correct animal with the correct simile. For younger kids, they can use the animal pictures on the paper plate pockets to help them! For older kids that can read, leave the pictures off the front of the pockets. This activity can be done again and again! You can also research additional animal similes with your kids and make your own puppets to match. Do you have a favorite simile that you use regularly? How about any favorite animal similes? My kids are excited to add a few more to this activity! Follow Chiêu Anh Urban on Facebook, Pinterest, Blog, and her website for more activities, printables, and updates on her darling books! Disclosure: This post is sponsored by Chiêu Anh Urban. All opinions are my own.